Published July 2, 2018 at 1:46 a.m. The mood backstage at the Uline Warehouse on Sunday evening was pure excitement – however, it wasn't quite music-related. Sam Price, drummer for lovelytheband, exclaimed, "We got Lebron!" He was reacting to a Twitter post on behalf of the Los Angeles-based, Laker-loving group. The Summerfest crowd took a little bit to win over, but once the show got going, it was more than willing to join in their excitement. After a short delay due to weather, the band took the stage and opened with "Pity Party" and "Pretty" to a bit of a tepid response. They picked up momentum and crowd involvement as the set progressed. 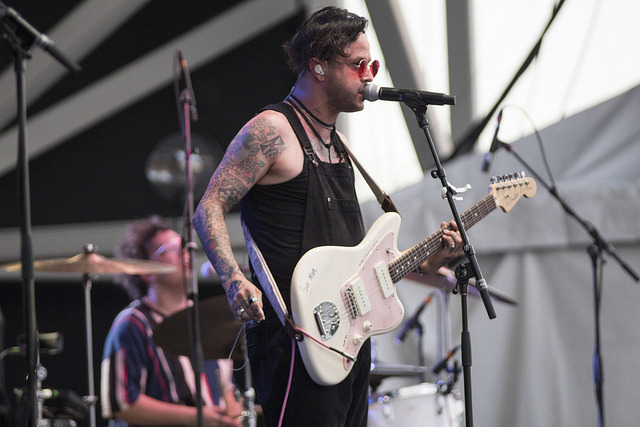 The tide seemed to turn on "Coachella" when lead singer and songwriter Mitchy Collins proclaimed that tonight the song should be called "Summerfest." The arm-waving crowd ate it up. Collins also confided that July 1 was their one-year anniversary. The band, like its music, has been expanding quickly. Billed and recorded as a trio, with Collins, Price and Jordan Greenwald on guitar and keyboards, they added Blake Riley on bass for tour, and at times during the show, an uncredited guitar tech joined in the fun creating a quintet. It's part of a growth pattern for this fresh band that was literally thrust into the spotlight with the runaway success of last year's "Broken." Collins, who had mild success with folk-pop duo Oh Honey, has evolved using the Benjamin Gibbard (Death Cab for Cutie) personal trauma for artistry's sake formula. 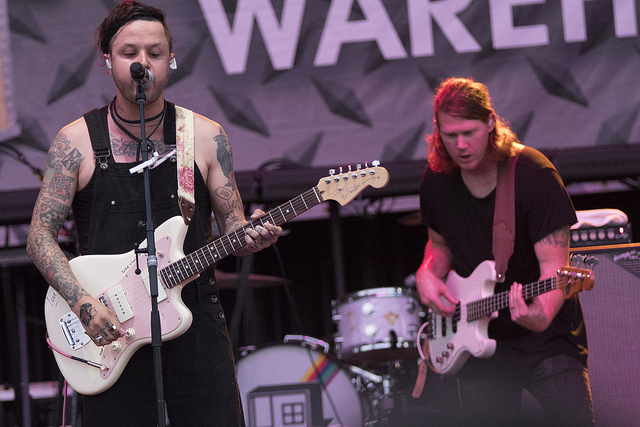 Lovelytheband's alt-pop is much a more accessible platform to build on his sad songs. The song was number one on Billboard charts for eight weeks. Not bad considering they've only had a six-song EP release, 2017's "everything i could never say." They spent most of the summer backing AWOLNATION; however, tonight they were supporting yet another L.A. band, The Neighbourhood. Lovelytheband will take a short break and then begin a steady diet of festivals for the rest of the summer. They are fine tuning and highlighting material for their Aug. 3 release. This is their first full length album, "finding it hard to smile," which will have some of the songs from the EP to round out the new material. The band will begin a headline club tour in the fall and hopes to build on its first Milwaukee appearance. Collins called it a "successful first date" as the fans were treated to a couple of promising cuts off the new album. "Emotion" was particularly well received. Collins invoked smart marketing as he challenged sections of the audience to recite the chorus for "These Are My Friends." They quickly learned as the catchy new release resonated through the receptive crowd. With sprouting bands, there are often misfires; these came on the covers, Ginuwine's "Pony" and The Killers' "When You Were Young," As they develop more of their own music, these will most likely be tossed aside. In the end, lovelytheband won over the Summerfest crowd closing with "Broken." Collins seemed very pleased with the reception they received, complimenting the audience's heartiness for sticking out the storms earlier in the evening. This is a band worth a second look as it grows its catalog of songs.